The 5th episode of our comic book ”Empowered From Within” is out! Project supported by ECORYS UK and the Lifelong Learning programme of the European Union. I have lived the whole of my life in a modern town, for this reason I wondered if the cultural aspect of Italy would appeal to me. By the end of my first night I wondered why I ever doubted the place !! In my spare time ( aside from TRYING to get a tan ) I have explored 2 cities – Bari and Matera. Bari was a brilliant experience, however I have to say Matera is on another planet !! When I first arrived in Matera I was thinking “ Seems like a nice place, nothing special “ Was fair to say I couldn’t be more wrong; It was beautiful. Some of the sights are truly breathtaking ! We had a walk around the city and the guys took me to this huge balcony. And beyond that was without doubt the best view my eyes have ever seen ! The villages down below with winding roads going in and out of the little streets that were barely 10 – 15 metres long. And beyond the streets you looked onto the hills and the sunset which made it look 10 times better than it actually was ! It’s fair to say I’m happy I’m doing most of my work in Matera. I’m staying in a fairly spacious flat in Altamura, barely a 5 minute walk from all the major shops and also the office. I live with 3 other guys and a girl who sleeps in a separate room. I enjoy all their company, we eat and do things together and it makes the experience so much more enjoyable when you can get along on a positive note with the people you live with. We spend a lot of time talking about our lives and what it is like in our own countries as well as what we are planning on doing with ourselves once our stray in Italy is over. I have to say though aside from the beautiful cities, the cheap food and drink, and the interesting culture there is nothing I have enjoyed more than the work. My work so far has been based on children. My first activity was working in Matera up in the hills. The children were on a adventure with the teacher and I was there to help the teacher with her activities. It doesn’t seem like much but when you are talking to the children it feels like you’re one of them, sharing the same jokes and taking the mickey out of each other’s football teams ( None of them knew who Middlesbrough were though haha ) At the end they all wanted a photo with me, and now just looking at that photo puts a huge smile on my face, knowing that I put the smiles on their faces that day. Shortly afterwards I arrived at my first school in Altamura where I was to help out in a lesson teaching 4-5 year old children English. It was therefore a little surprising when I got to the class to discover there was only 3 children in the lesson !! Consequences of the Italian recession I guess. We were going through basic topics, such as colours, months of the years and numbers. It was fascinating watching them learning these things, going from not being able to pronounce a certain word to memorising the word and saying it to perfection. 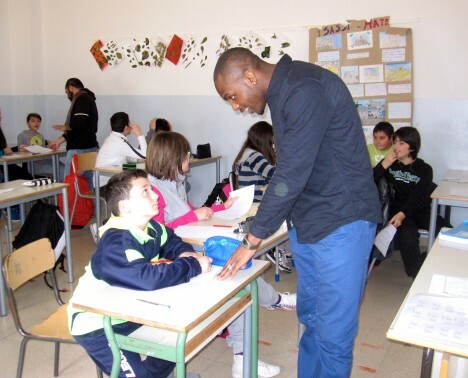 The 2 days after that consisted of 2 schools in Matera in which I was a guest in 4 different classes. On the first day I was in 3 different classes, all of which the children were around 13-14 years old. They seemed really interested at having an English guy in the class ( They too were learning English ) And I must have had around 382949394 different questions fired at me that morning. Half of them were based around football though, which isn’t too bad at all ! This was perhaps my favourite day so far. The children were so kind, full of manners and respect, but also funny and interesting at the same time. At the end of the classes they all wanted photos with me and were asking if I was to come back to the school again ! And even some of the girls and boys were asking me to put my Facebook name on the blackboard. The several friend requests at the end of the day were no surprise ! The second class I was in were a little younger ( 11-12 ) However I was amazed by how intelligent they were, and how far they had come in their English speaking skills. They were asking me questions in a way that any fluent English speaking person would ask them. They were the loudest out of the groups, but in a good way ! When I asked one of the children which football team he supported he said Juventus and asked me if I supported them. My reply was “ Noooooooooooooo “ Instantly around 2 / 3’s of the class jumped up out of their seats and started clapping their hands and cheering. I guess football is quite popular amongst these children ? On the day of writing this testimony I have been here for exactly 2 weeks to the hour. It is fair to say this is an experience that is changing my life. In the future part of my plans is to hopefully work with children, and help those who are in need of it. Being able to interact with these children, help them learn and to make them smile is something I am very proud of. I only have 12 days left here but hopefully these next 12 days – along with the 14 I have been here for – turn into one of the best months of my life ! I would also like to thank the guys at Everything Is Possible ( especially Aurelie and Godfrey ) for giving me this opportunity. It is not something every person has the chance to do, and I’m glad I was lucky enough to receive this chance. This is a brilliant experience for me and holds many stories for me to tell when I get back to England. I will be celebrating my 21st birthday on the 24th May ( 6 days before I leave ) and I can safely say this is the best present I have received in my life !! Steven Birdsall, Leonardo Da Vinci trainee. and the Lifelong Learning Programme of the European Commission. It was my first time in Italy and I had no idea of what it would be like. I had a faint idea of the Italian language which was only a few words. The first day when I arrived in Italy I was shocked by the weather, I thought that it would be a bit hotter than it really was. Although the weather was not bitterly cold like England my home of residence I could still feel the chilly breezes. One of the attractions that took my mind when I first saw it was the city of Sassi this is in the region of Matera which is twenty kilometers away from where I was staying, Altamura. Sassi was a old city which was made of limestone and held up to 50 thousand people also this city was where the film The Passion Of The Christ was filmed. Also in my first week I visited a old church high in the mountains of Matera where a cave was used as a church by the monks that came from Greece, so that they could have a place of worship for their religious beliefs which Christianity. In this cave they told me about the first story of Genisis which is recorded in any bible they had to come from Greece to Italy due to the laws that were in place back in the middle ages. I found the whole city of Matera a very interesting city and also historical. 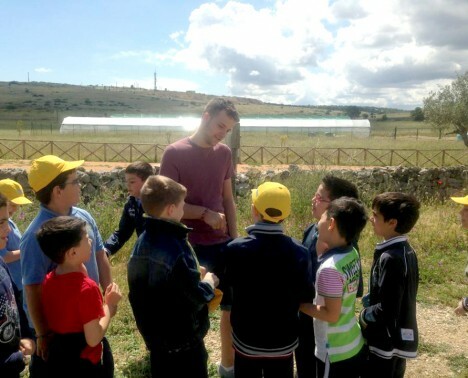 Also in my first week of my Leonardo Da Vinci Mobility project I was doing some work in a school in Matera helping out children when doing orienteering skills. These children that I worked with were very lively and willing to learn and interested in many things, this was a primary school where the children were around the age of twelve years old. During my first week in Altamura where I was staying I visited Matera again to give a presentation about Youth In Action and the Everything’s Possible to a group of high school teenagers who were interested in going abroad and travelling through Youth In Action to gain a different experiences and to get to know about different lifestyle and cultures. I found that this was very interesting in my first week in Italy. My name is Eleni, I am 29, Greek and I live in the UK. I have studied Psychology and Education and now I am on a 4-week project with children, in Matera, in South Italy. This is the second week of my European Voluntary Service project and so far things have turned out to be better than I expected. Every afternoon, from 15.30-20.30, I work with two other volunteers in an after-school center, which offers support and creative activities to children aged from 3 to 12 years old. The host organization teaches us Italian twice a week, so this enhances our communication with children and in general facilitates the adaption in a foreign country. In my free time I take a walk around Matera, which is a historical, Unesco-protected, old town, either with my house-mates or by myself. Italian people are very open and friendly, so you never feel alone! Of course the best part is the food, as I enjoy delicious pizza or focazza every day! Just great! Eleni, short term EVS (European Voluntary Service) volunteer in Italy.